Revzilla's latest giveaway contest is a doozy: $1027 worth of Rev'It! gear. 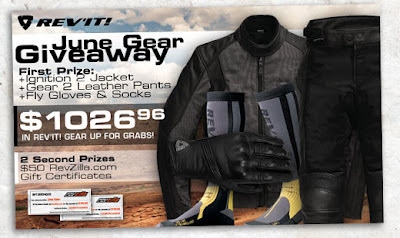 To enter, click over to RevZilla's June contest page. The First Prize winner this month will receive an Ignition 2 jacket, Gear 2 pants, Fly gloves and socks. Two Second Prize winners will receive $50 Revzilla gift certificates.